The English Electric Canberra first flew on Friday 13 May 1949 and created a sensation by outperforming all contemporary fighters. It went on to complete more than 50 years’ service with the RAF and is widely regarded as one of the finest designs of all time. 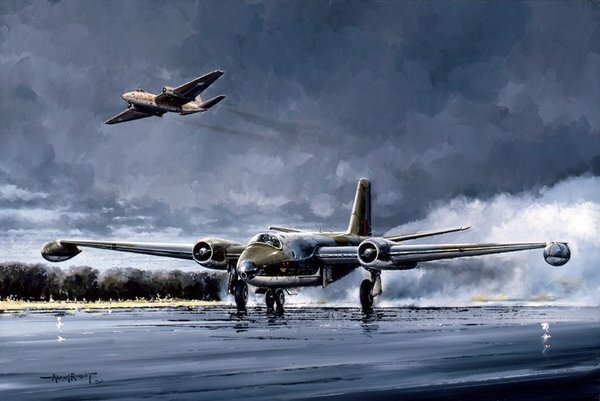 Mike Rondot's Canberra Tribute features the two most popular variants: the ubiquitous Canberra B2 in brilliant sunshine on take-off, and in the background, against a backdrop of stormclouds, the powerful Canberra PR9.